Ratan N. Tata is the chairman of India's largest conglomerate, the Tata Group, established by his family's earlier generations. Tata is organized into seven divisions: engeneering, materials, chemicals, energy, NTIC, services and consumption goods. 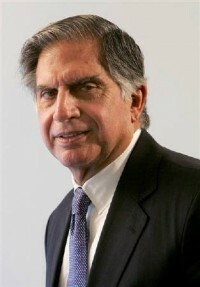 Ratan Tata was born in 1937, in Mumbai, India. The Tata family have been active in industry and philanthropy since the 19th century. The Tata Group, founded by Ratan's great grandfather, Jamsetji Tata, is one of the largest private employers in India. JRD Tata, Ratan's father, was the first Indian citizen to obtain a plane pilot's license, and he is considered the father Indian aviation. In 1932, he founded Tata Airlines, which became Air India in 1946. Ratan's childhood was troubled as his parents divorced when he was 7 years old. He was raised by his grandmother. After the Campion School in Mumbai, he graduated in Architecture and Structural Engineering from Cornell University, New York, in 1962. That same year, he joined the Tata Group to work in the family steel plant in Jamshedpur, where he shoveled limestone and handled the blast furnaces alongside other employees. In 1971, Ratan was named Director-in-Charge of the NELCO (National Radio & Electronics Company Limited), a venture that was in dire financial difficulty. But with a lot of flair and despite JRD's disapproval, he invested in developing high-technology products. The company climbed from a 2% market share to 20% in 1975. But the economic recession of 1975 and the confrontations between Tata with the unions took its toll on the venture. In 1981,Ratan was appointed chairman of Tata Industries, the group's other holding company, where he was in charge of transforming it into the group's strategy think-tank and promoting new ventures in high-technology businesses. Ratan took over as group chairman from JRD Tata in 1991, and since then has ushered in young managers pushing out the old guard. He reshaped the fortunes of the Tata Group, which today holds the largest market capitalization of any business on the Indian stock market. Ratan also introduced Tata Motors on the New York Stock Exchange. In 2006, Ratan signed agreements with Italian car manufacturer Fiat and helped introduce the Italian cars the Indian market. In December 2007, Ratan, who turned 70, launched the "peoples' car," officially the Tata Nano, at Auto Expo in New Delhi. It's the world's most inexpensively manufactured car and is sold for $2.522.